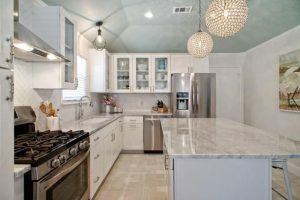 Of course, like any other homeowners, you also treasure your gorgeous marble kitchen countertops in Dallas. And it is only right considering you spent a great deal of money buying and installing them. By now you should have understood the importance of cleaning and maintaining. Interestingly, there is a way to do these without using a commercialized neutral pH cleanser. That is because you can do away with a baking soda. Marble is a soft stone made of calcium carbonate and thus gets easily tainted, dulled, and scraped. This also means that you have to make sure it does not get scraped or exposed to acids such as such as vinegar and other solid alkaline agents like ammonia). Baking soda is alkaline, so you really have to use it with care. It is also a mild abrasive, which means that you need to utilize it gently rather than applying too much pressure in your cleaning tasks. Because of these variables, you must use baking soda simply infrequently instead of doing it on a daily basis. Using it regularly might just dull your Dallas marble kitchen countertops. Moreover, do not think of leaving baking soda or a solution of it in contact with your marble counters for a long period of time. Otherwise, the surface will be damaged and stained. And when cleaning, use a warm water and soft fabric. This cleaning method is very simple. You just need to sprinkle a small amount of baking soda on top of our marble countertops. From there, gently rub it into the surface using a soft cloth or fabric. Again, remember to scrub gently and never put too much pressure. You need to rinse with water and dry using a soft towel. Tip: Rinsing it with water will neutralize the pH, so do not forget this step here. Lastly, make sure the surface of the countertop is dry enough. Otherwise, the solution will get in contact with the surface for any longer than what is actually necessary. 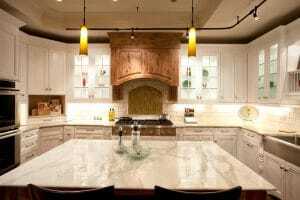 If you want to learn more about cleaning and maintaining marble kitchen countertops in Dallas, give us a call at Hard Rock Imports. We will be more than happy to assist you. More importantly, we can give you a no cost, no obligation design estimate. Call us now!